With all the best bits from a Sunday roast, this tray roast salad is comfort food made healthy... Isn't that what greedy foodie dreams are made of? Wash and dry the potatoes. Cut them length-wise and place in a bowl. Add 1 tbsp olive oil and a good pinch of salt and mix until well coated. Spead the potatoes onto a baking tray. Add the sausages to the side and roast for 30-35 minutes. In a clean jar, combine the Dijon mustard, balsamic vinegar, olive oil, and a good pinch of salt and pepper. Pop the lid on and shake vigorously. Remove the tray from the oven and slice the sausages into bite-sized pieces. In a large salad bowl, layer the salad leaves, roasted potatoes and sausage pieces. 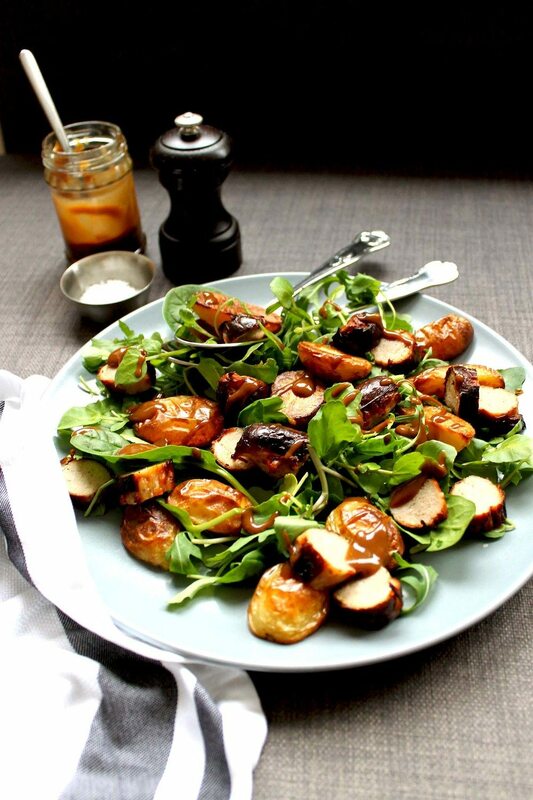 Drizzle a few tablespoon of the balsamic and Dijon vinaigrette on top and serve immediately.